Having crafted two enduring cult pop albums under comparatively humble circumstances, Masha Qrella has embarked upon a more ambitious project for her latest full-length. For one thing the songs were arranged for a full band line-up and then recorded live in a proper recording studio over a number of sessions, but perhaps more striking than that, all these compositions are reinterpretations of Broadway classics penned by Kurt Weill and Frederick Loewe. Qrella was approached by Berlin's Haus Der Kulturen Der Welt, charged with the undertaking of assembling a themed evening of performances as part of the 'New York-Berlin' celebrations - marking the venue's 50th anniversary. 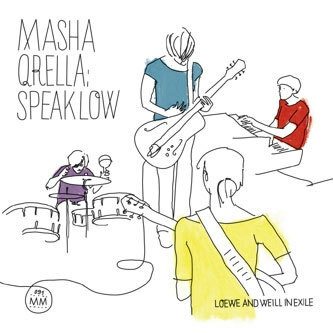 Both Weill and Loewe had their origins in Berlin yet met with wider international success through their work on Broadway, so their part in all this makes sense, but Qrella's role seems surprising given how far away her lo-fi, homely pop songs are from anything you might associate with musical theatre. Therein lies the success of this whole project: the sheer lack of theatricality or any sense of drama means interpretations of 'Speak Low' and 'September Song' come across as liberated and minimal - stripped beyond their essence to skeletal almost punkish manoeuvres. 'I'm A Stranger Here Myself' proves especially rewarding, delivered with a staccato, reverberant guitar line that leaves no room for embellishment or baggage. The melody, led by Qrella's strident vocal conveys itself as powerful and resoundingly modern, bridging the gap between not only Berlin and Broadway, but between the 1940s and the present.